Monday’s game didn’t end well, but Tuesday was a new day and I was looking forward to it. I started off the day with a 7:45 interview with Spike and Chris of the “What’s the Word” radio show. We recorded my segment in the morning but the show airs at 3:00 PM and I was on for just over 20 minutes. Spike also wrote an article about me and you can read it here. If you actually want to listen to the segment, you can click here. Thanks to Spike for setting it up, and to Chris for agreeing to have me on. 1) The exterior of he restaurant. 2) The view from my two person booth. 3) The bar, with some cool bar stools. 4) My breakfast. 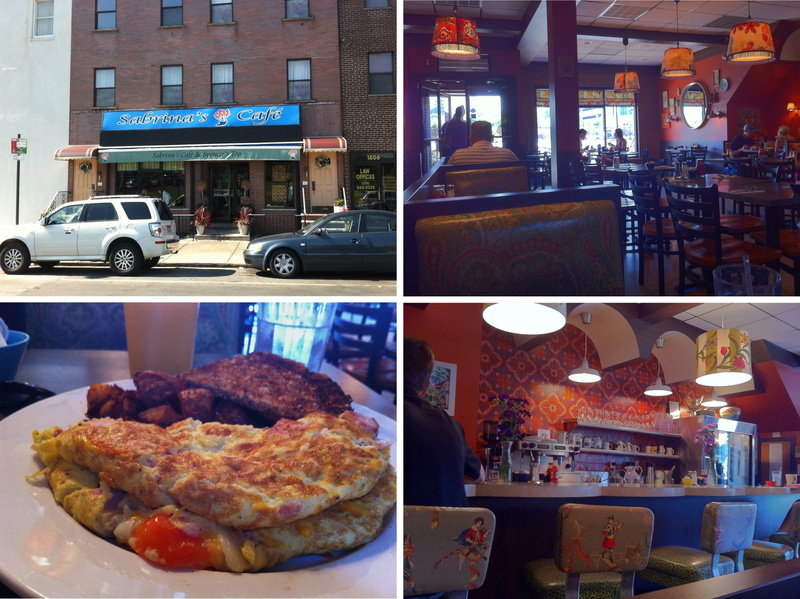 I ordered the Bella Vista Omelette (create your own) with ham, tri-bell peppers, grilled onions, and Wisconsin cheddar. I also ordered a $4 glass of freshly squeezed orange juice (because I’m worth it). Ha! I think the toast had been toasted 10 minutes before I got it, and it was very hard. I put it under the omelette and that seemed to soften it up (slightly). I took a bunch of pictures but I will only be showing some of them due to the fact that it’s 12:50 AM. I’ve got an interview at the park in 11 hours and then a 15 hour drive after the game. 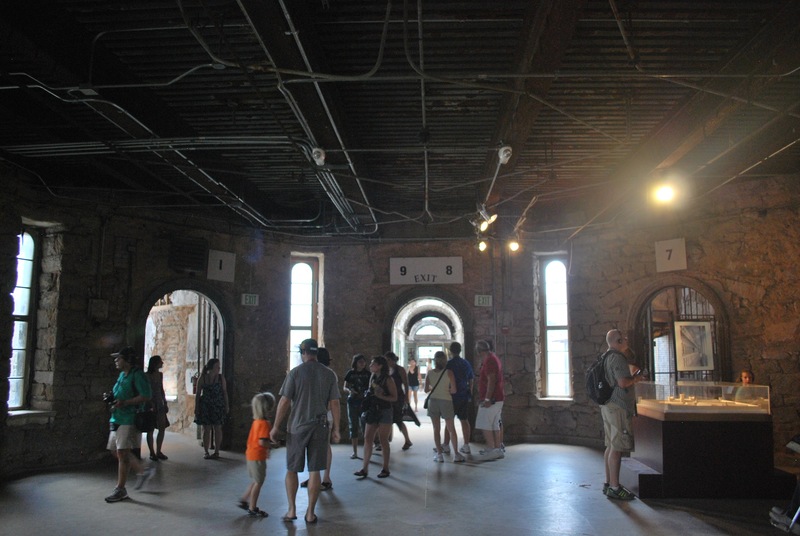 Once you enter the structure and pay your admission you are given headphones and an audio player for the self guided tour. There are ten stops on the main audio tour but another 50 or so that you can also check out. They have maps that show where each audio stop is located. You could just sit down and listen to them all in order without moving, but where’s the fun in that? 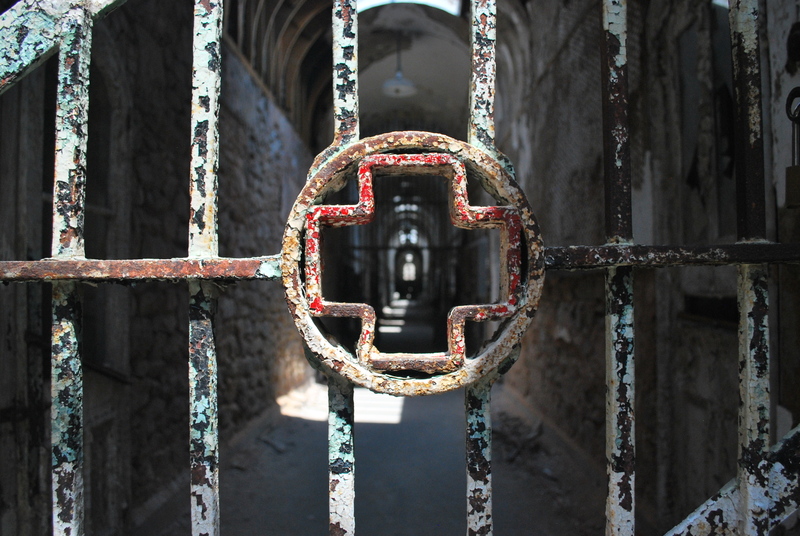 Eastern State Penitentiary (ESP) was designed (at first) to provide as much isolation and solitary confinement as possible. 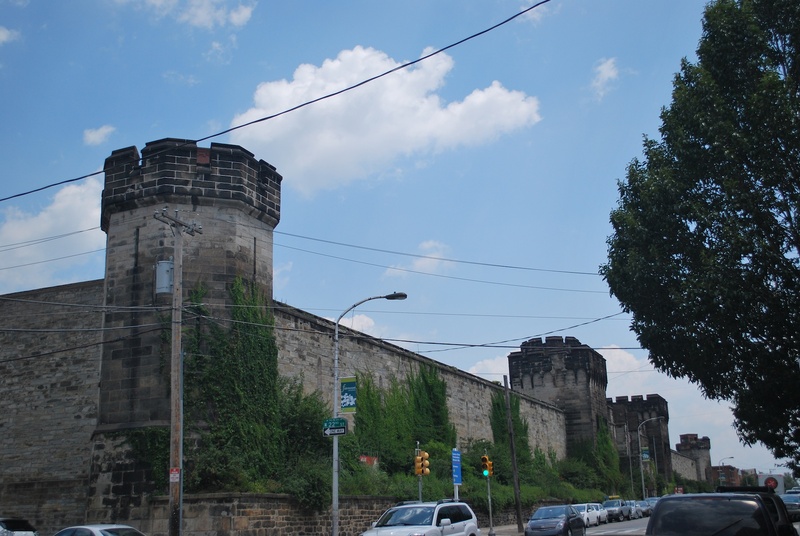 This way of treating inmates was called the Pennsylvania System. 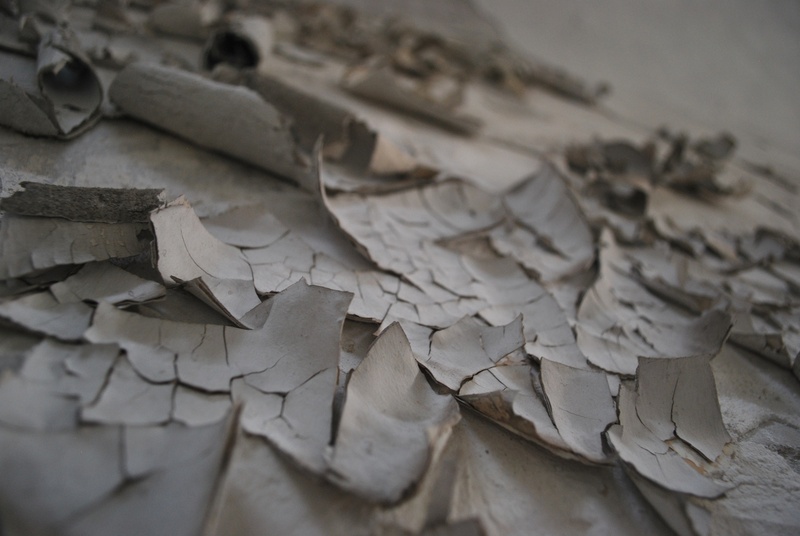 They felt like that was the only way for criminals to understand true penitence, the root word of penitentiary. 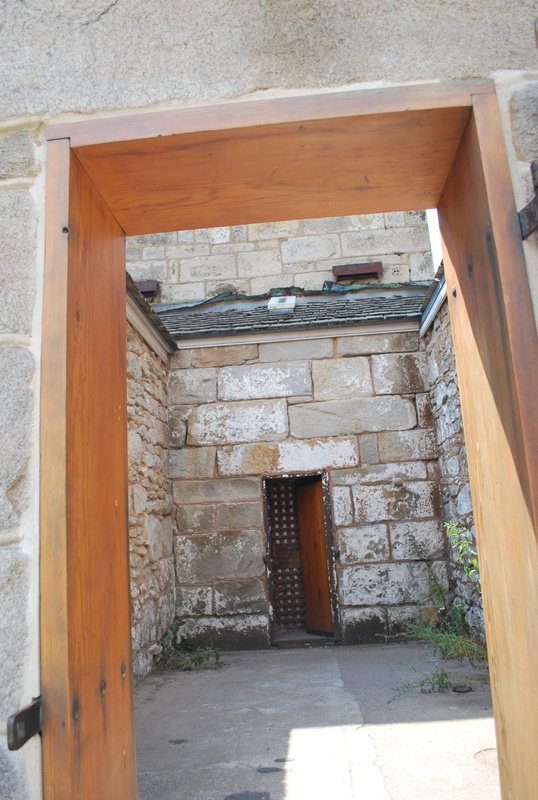 There didn’t used to be doors in the cell block that allowed access to each cell, those were added later. The only way into each individual cell was through the exercise area (through the doorway that I’m standing outside of in the picture above). 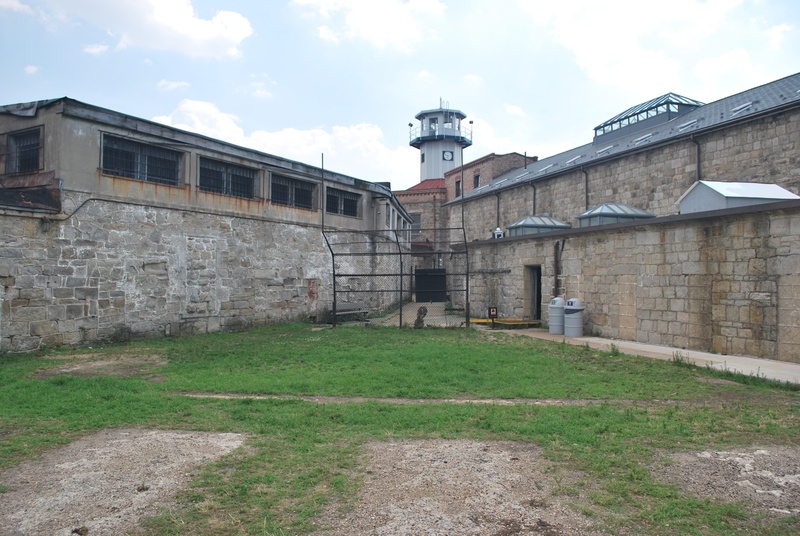 The prisoners would get two 30 minute breaks to be outside in their exercise area, but it wouldn’t be at the same time as neighboring prisoners (to eliminate communication as much as possible). The prisoners would have bags over their heads when led to their cells to help disorient them. 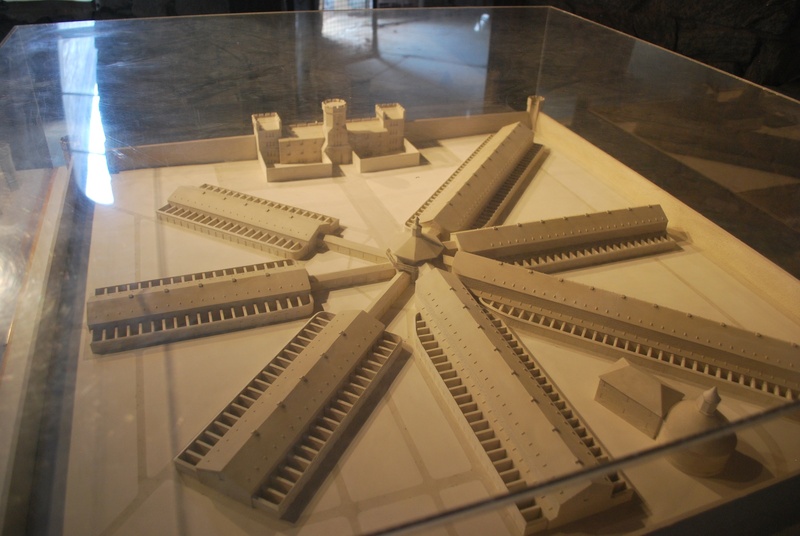 I’m kind of jumping around here, but before I spoke of “the Center”, which served as the hub for the cell blocks. 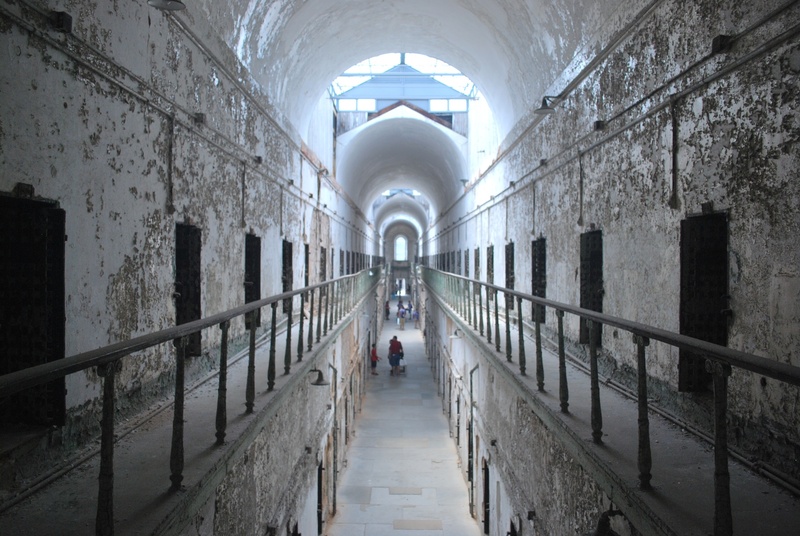 The solitary confinement techniques and the Pennsylvania system broke down, leading the penitentiary transformation into a more traditional prison. This meant more prisoners could be housed at the facility, which helped cut costs as well. 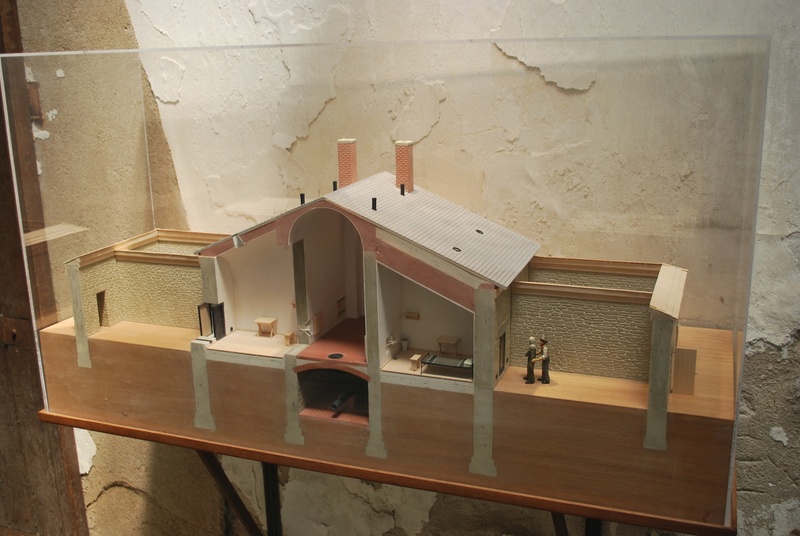 The original design called for seven cellblocks one story high but after the third cellblock they modified the design and the remaining cellblocks were built as two-story structures. They let you walk up the stairs in cellblock 7, and it provides for a nice picture. 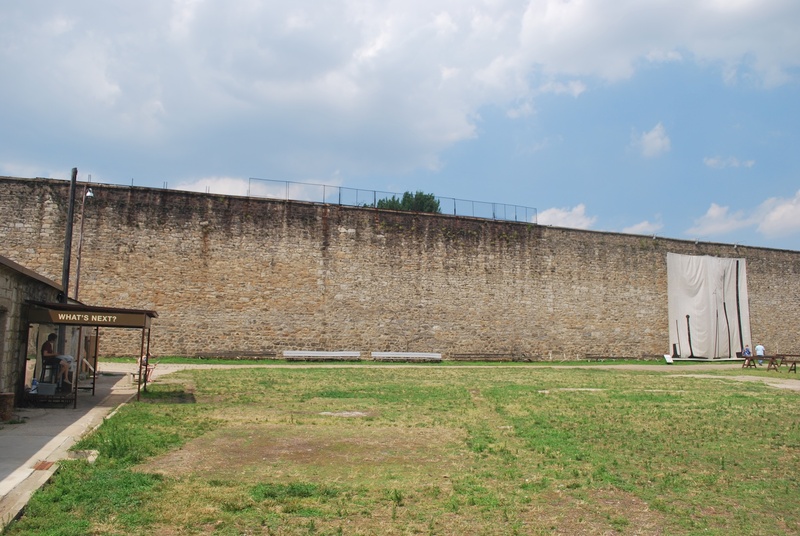 Once it became a more standard prison, sports came into play. The picture below shows the backstop used for baseball as well as the goal posts for football. That chain link fence at the top was added to try and keep baseballs from leaving the yard. They also had problems with people throwing baseballs back in. Some had notes from loved ones with instructions to deliver to so and so while other baseballs were altered to conceal weapons, drugs, and other objects. This was the gate on the hospital block, and I just like the way the picture turned out. 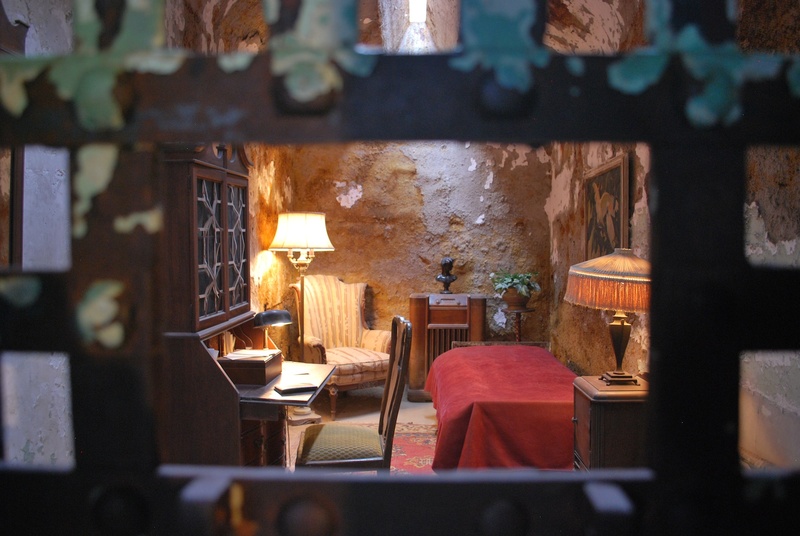 Al Capone was housed at ESP for 8 months towards the end of 1929 and into 1930. 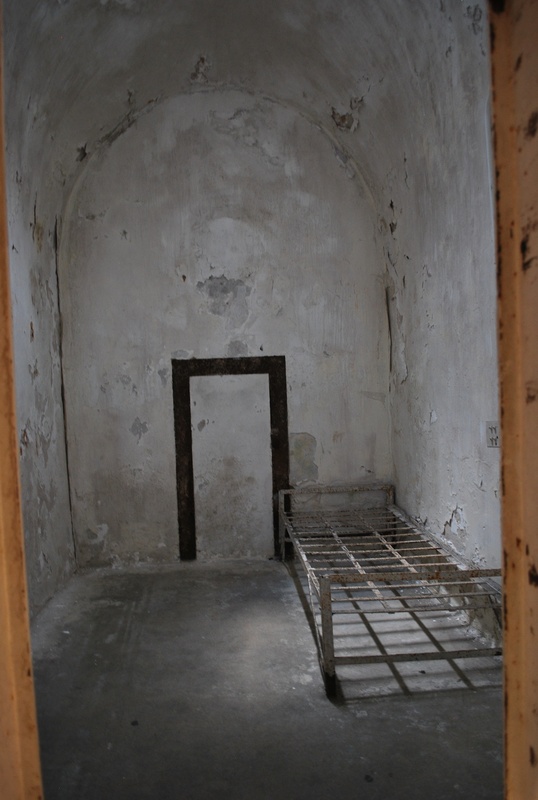 They tried to recreate what his cell looked like when he was there. As you can see, his experience at the prison was likely much different than the other criminals. I returned to Mike and Meg’s place for some rest before leaving for the game. I took the Subway again and was at the sports complex at 5:30. Mike was meeting me at the game and he had gotten us tickets from a coworker. I went inside and met up with a twitter follower, who had tweeted at me Monday asking if I could stop by. His name was Mike and he works at Citizens Bank Park. He’s 22 and is also a cancer survivor. He’s a cool guy and I wound up seeing him later in the game as well, when he gave me a keychain with some infield dirt. 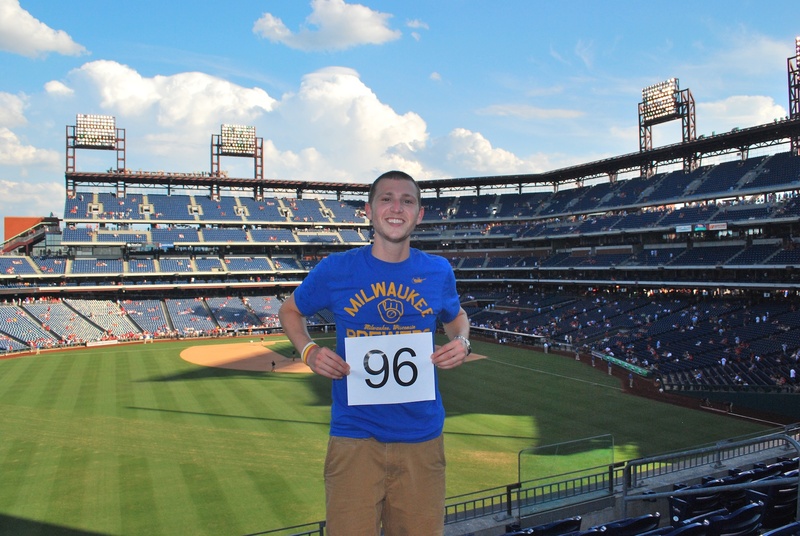 I went to the left field second level “bleachers” (they’re actual seats) for game photo number 96. I talked with a married couple and the husband took the picture for me. 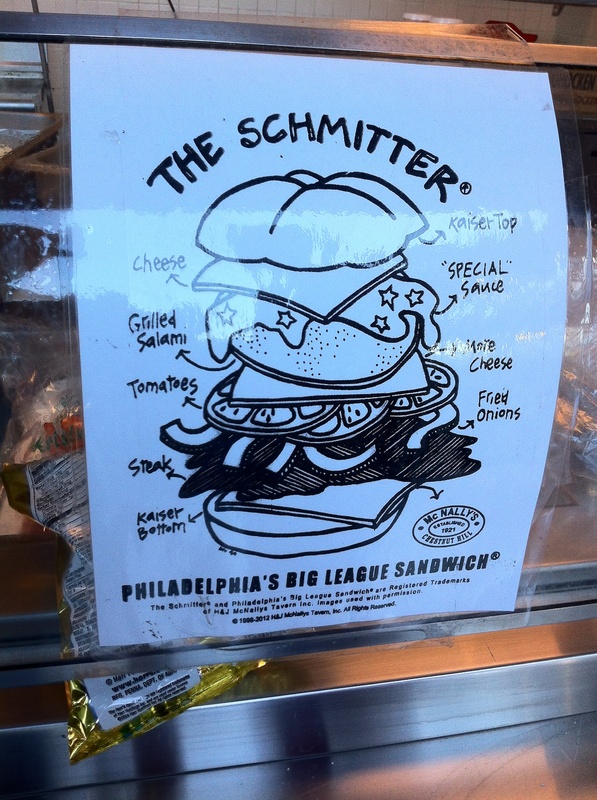 Someone had tweeted that I need to get a Schmitter, which I found out is NOT named after Phillies great Mike Schmidt. The stand thankfully had a diagram so I knew what I was about to consume. 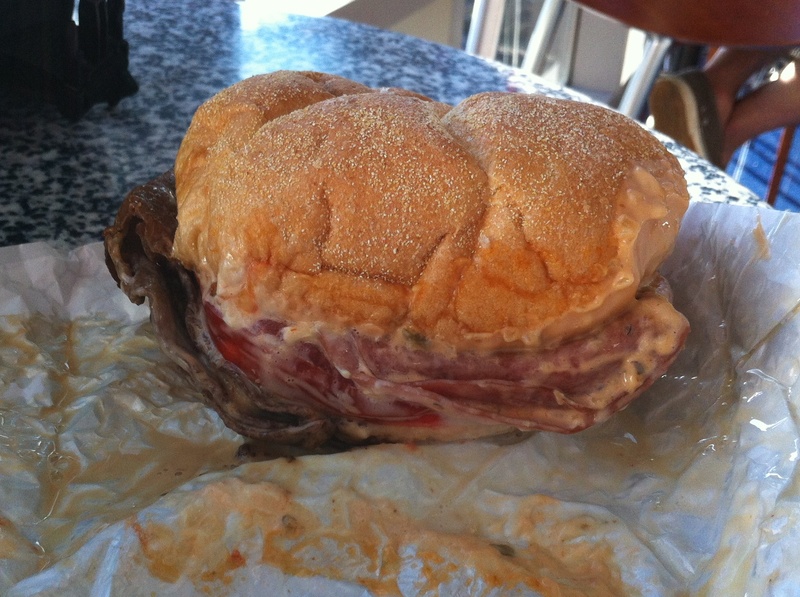 If you can’t read the diagram: it consists of steak, grilled salami, tomatoes, cheese, fried onions, more cheese, and “special sauce”, all on a Kaiser roll. I ate the Schmitter quickly up in the Hall of Fame Club, where our seats were located, and then went out into the seating bowl in time for first pitch. Mike had just gotten there from work and we were both ready for some baseball. It is now 1:53 AM, so I’ll be brief with the game. 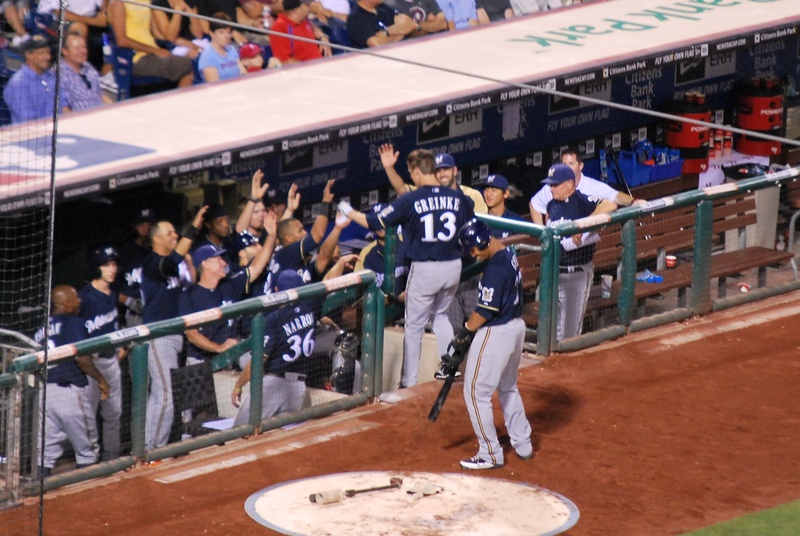 The Brewers took a 1-0 lead in the top of the first but the Phillies answered and tied it in the bottom half. 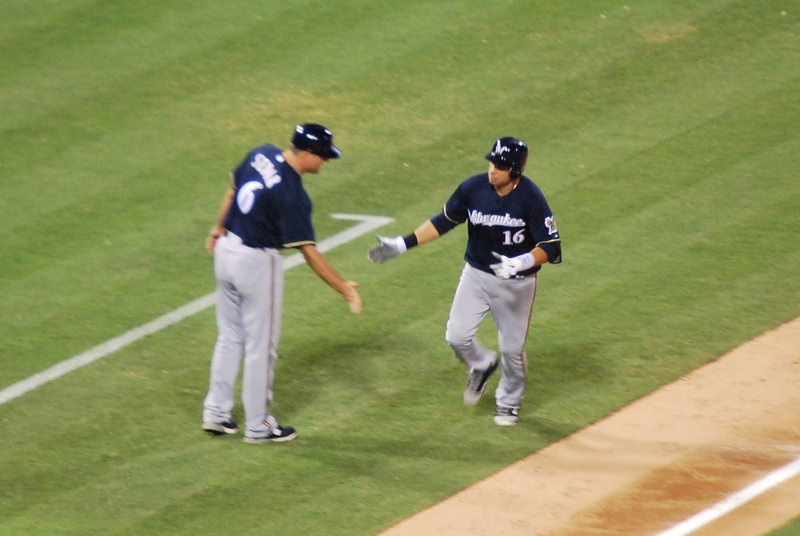 The game remained 1-1 into the 6th, when Ryan Braun led off the frame. He sent a missile to centerfield that ricocheted off the batters eye. According to hittrackeronline it only reached 68 feet at it’s peak, and that seems about right. I got a picture of him just after making contact. The ball is a blur about a finger’s width from his bat. The Brewers had a 6-1 lead and I thought it was a good time to get a picture of Mike and me. A fan two rows back did the honors. Mike’s from Michigan, thus the Tigers “D” shirt. 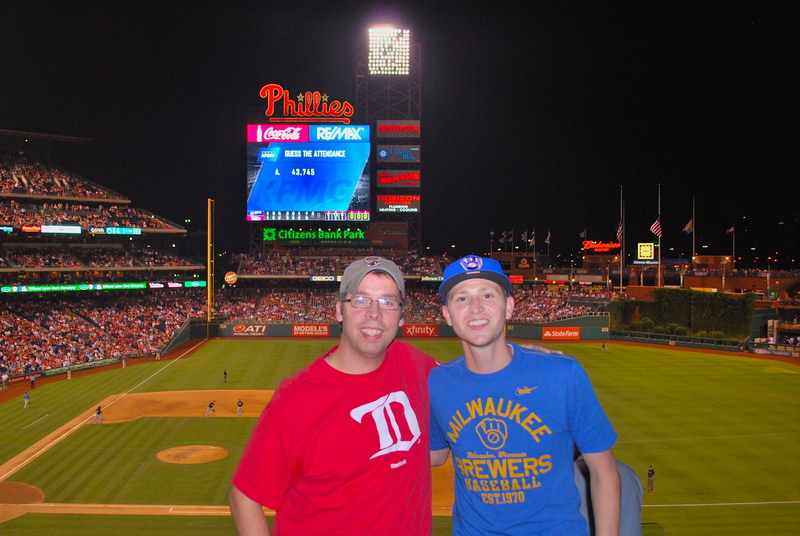 He’s smart though, and has this red Tigers shirt that he can wear to Phillies games to trick other attendees that he’s one of them. I can’t thank Mike and his wife Meg enough for letting me stay at their place. I was basically a complete stranger and he opened his home up to someone because a friend of his said I was an OK guy. That’s very trusting of them and I’m very appreciative. He’s the vice chair of The Dude Hates Cancer, and they throw a bowling tournament every year to raise money and awareness for the Leukemia and Lymphoma Society. Great cause. If the night could’ve ended right then and there it would have been an amazing day. It didn’t end though, and this is what happened in the bottom of the 8th when the Phillies batted: single, ground out, 2-run home run, line out, walk, walk, walk, 3-run double, RBI single, walk, force out. If you were counting that’s 6 runs the Phillies scored, 4 of them with two outs. 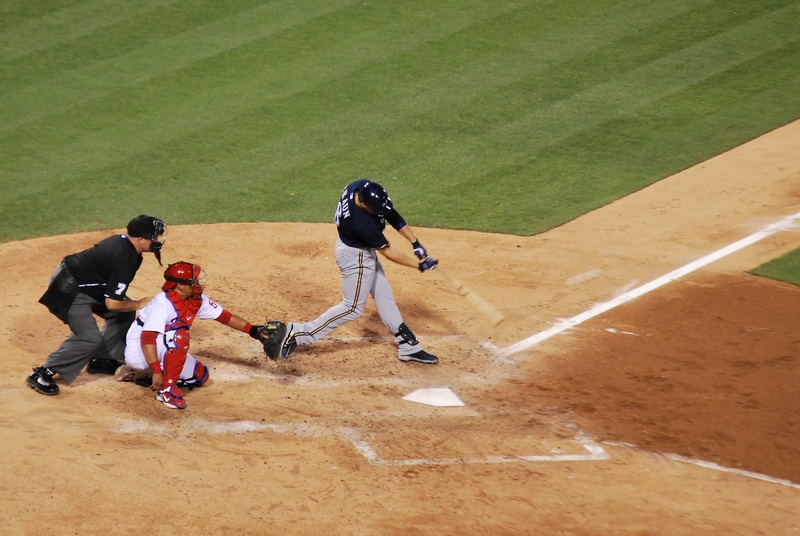 The Brewers went quietly in the ninth and once I again I was demoralized. I’m getting used to it but it still is hard to watch. Final Score: Phillies 7 – Brewers 6. You can’t walk the bases loaded too many times before it’s going to come back and haunt you, and that’s exactly what happened tonight….. errr yesterday. It’s 2:34 AM now. Goodnight. 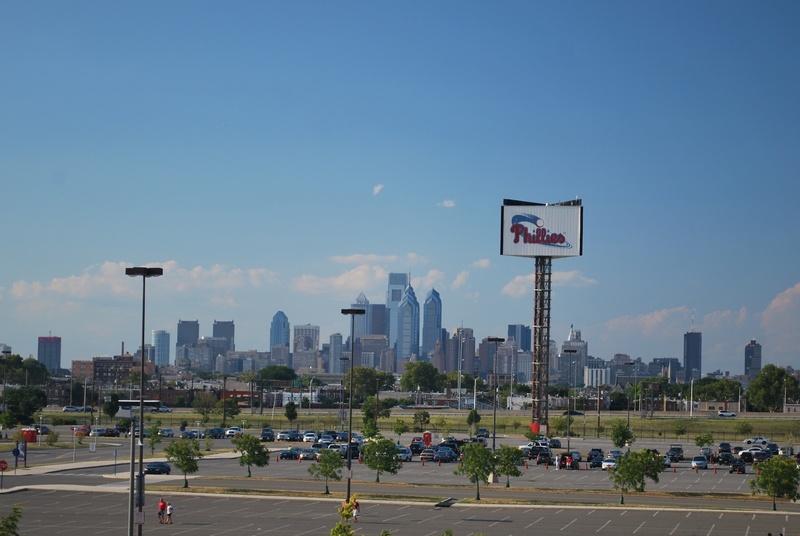 Oh, I’ll be on the Phillies pre game radio show at 11:40 AM on 94 WIP (I believe that’s the right station).